Two pending product liability lawsuits including one wrongful death lawsuit, 6100 consumer complaints and a recent recall letter from the NHTSA following an Engineering Analysis of the Office of Defects Investigation have convinced Graco Children’s Product to conduct a recall of the seat harness buckles on most of its children car seats models manufactured since 2009. The defective harness buckles are becoming more difficult to open over time or become stuck in the latched position especially if it gets clogged up with food or dirt. Stuck or sticking buckles may prevent or impede the removal of the child from the car seat in a case of an emergency. 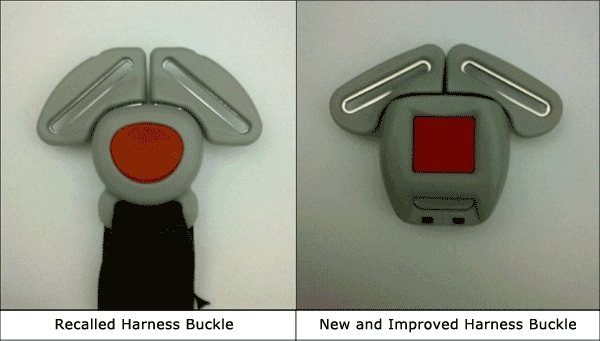 According to the NHTSA Graco has been named defendant in two product liability lawsuit related to defective harness buckles. The first one is a consumer class action complaint alleging that the buckles is unreasonably difficult to unlatch or simply doesn’t unlatch. The second lawsuit is related to the death of a young child who died in car fire. Plaintiff alleged that parts in Graco car seat design made it extremely difficult to remove a child that was secured in the seat during an emergency. The recalls 3.7 millions units. Parents who own a defective car seat model and have previously registered it with Graco will automatically receive a Consumer Notification Letter with instructions on how to order a buckle repair kit. Parents who didn’t register their products can order the blucke repair kit online. Click here for complete list of defective models and contact details.